The next big veggie thing could come out of Flanders. 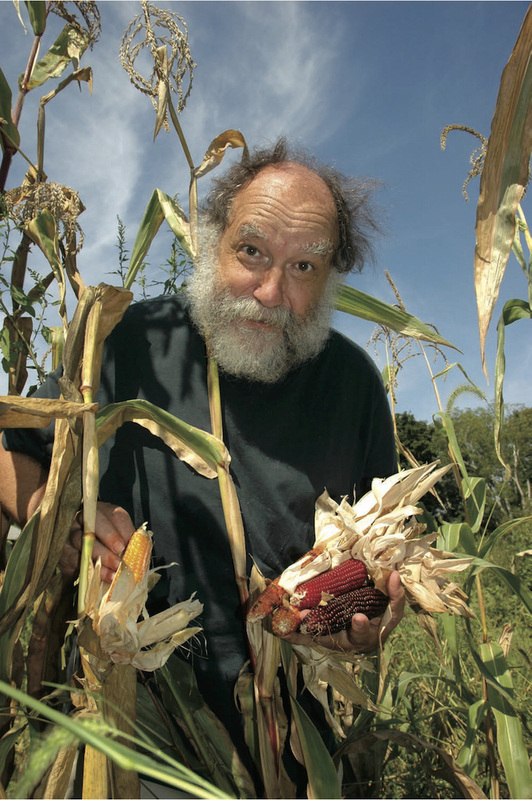 Ken Ettlinger, with his edible-ornamental corns, is one of the nation’s leading seed breeders. “Welcome to the weed patch,” says Ken Ettlinger. It’s late October, and he clutches a bundle of lanky lettuce plants whose cottony tufts of seed blend with his own sprawling salt-and-pepper beard. Nearby, emaciated green beans and brown, puckered edamame hang in the wind. Acorn squash are bloated and overripe. Tomatoes and cucumbers have rotted and desiccated on the vine. Succulent ears of sweet corn shrivel in the sun. A plot of carrots would be unrecognizable to Bugs Bunny with rows of alien-looking pom-poms swaying in the wind. The ramshackle farmhouse, half-finished greenhouse, and smattering of straw bales, wheelbarrows and lawn mowers, don’t help shake the feeling of neglect on this sprawling 17-acre farm that cascades from field to forest and eventually down to the Peconic Bay. But so much about Ettlinger and his “weed patch” evade easy categorization. You see, Ettlinger, is actually one of the leading independent crop breeders in the country—perhaps the world—and all this apparent chaos actually represents hundreds of attempts to ferret out a new flavor, color, or robustness in an agricultural plant. Among those new creations that Ettlinger’s careful, steady coaxing and crossbreeding has birthed over the past few decades are the brandywine tomato, the Long Island cheese pumpkin, and other American seed-catalog favorites, not to mention dozens of yet-to-be-released varieties. There’s a perennial broccoli that can almost survive East Coast winters, a yellow-skinned watermelon, golden and purple snow peas, marble-size currant tomatoes with intense crunch, the muskaloupe with Old World ambrosia and New World hardiness, miniature white cucumbers, and miniature, disease-free sweet peppers, dubbed fingerlings, that have already inspired buzz among organic farmers on both coasts. “I like finding the thing that you don’t quite know what it is until you find it,” he says. At a time when 10 companies control half the world’s seed market, and the world has lost an estimated 75 percent of its seed diversity in the last century, Ettlinger’s work is actually revolutionary, if not imperative to the future of humanity. Seed isn’t just the bridge between one food harvest and the next, or the source of new flavors, colors and other sensory pleasures. It’s also our best hedge against a shifting climate, a new crop disease, or any catastrophe that might befall our agricultural system. Ettlinger comes from a line of seed savers. His mother, who grew dahlias for the cut-flower industry at his childhood home in Deer Park in the 1950s, saved her favorite vegetable and flower seeds. Both his German grandfather and Italian grandmother brought seeds from the Old World, including a monstrous cuccuzi squash that Ettlinger still grows. Since every farmer and gardener has different soil, microclimates, and disease, weed and pest problems, selecting and saving seed from those plants that flourish will mean better results the following season. “Conventional seed is bred to do okay everywhere rather than really thrive,” Ettlinger explains. And while large-scale seed breeders may be interested in crop varieties that withstand shipping or can be mechanically harvested, a small, organic farmer may want a variety that likes compost and manure or one with superior flavor to sell at a nearby farmers market. 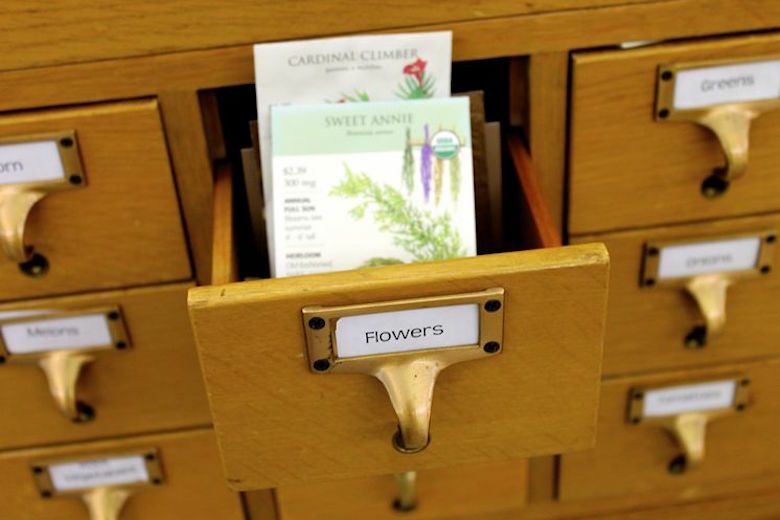 Ettlinger scoured seed catalogs and gardening magazines for interesting varieties, with a particular eye toward little-known companies or exotic packets from Europe and Asia and Latin America. Thwarting US Department of Agriculture prohibitions, friends who were traveling abroad would bring him seeds (or dried veggies with seeds inside) as souvenirs. (That’s how he got his impressive collection of Asian long beans, plants that thrive in hot conditions, when other beans often shrivel. “Every little village and community in Thailand has its own variety.”) And he became part of a small, close-knit circle of seed savers around the United States, who would help give birth to a resurgence of home gardening, heirloom vegetables, and an appreciation for good food. “All of a sudden, we had a reason for what we were doing because we had a network,” he says, remembering the formation of the Seed Savers Exchange, a group founded in 1975 whose 8,000 members trade nearly twice as many vegetable varieties as are available from all of the mail-order seed catalogs in both the U.S. and Canada. To support the seed-saving habit, Ettlinger, who is trained as a geologist, began to teach geology, meteorology, oceanography, and botany at Suffolk County Community College in Riverhead. (He also leads a relatively large botany club at the college.) Around the same time, Ettlinger bought his Flanders property and founded the Long Island Seed Company. And, then, just as Ettlinger became a go-to source for seed brokers from Johnny’s, Territorial, and the nation’s leading catalogs, and his personal holdings—from tropical basils to Southern okras to ornamental gourds to Native American beans—multiplied, the emotional stress of a divorce and other family challenges forced Ettlinger to abruptly close his seed bank. Fortunately, seeds, if stored in a cool, dry place, are designed to stay viable for a long time, waiting for just the right person to add a bit of soil and water. In this case it took about 10 years for Ettlinger’s teenage son, Zak, who stumbled upon his father’s seed room (perhaps prompted by a gardening interest tucked deep within his own DNA), to revive the seed-saving effort. Zak cut through the clutter and selected curious-sounding seeds to plant. He enclosed the front porch with plastic sheeting and added some grow lights. Silvia Carter, at Newsday, heard that a young man was raising heirloom tomatoes on a Flanders front porch, and mentioned in her column that the plants would be available for sale in early spring. That season, father and son collaborated to stock a popular roadside farm stand. Zak, who is in film school in South Carolina, but returns during the summer to help his father plant the garden, saved his father in a way, but he also ended up saving the tremendous wealth of seed. If a team of scientists were preparing a selection of seeds to send with explorers colonizing a new planet or deserted island, the pantry off Ettlinger’s dining room would be a good place to start. Floor-to-ceiling shelves hold plastic and paper bags, wood bowls, deli containers, glass jars, Tupperware and other receptacles full of seed. 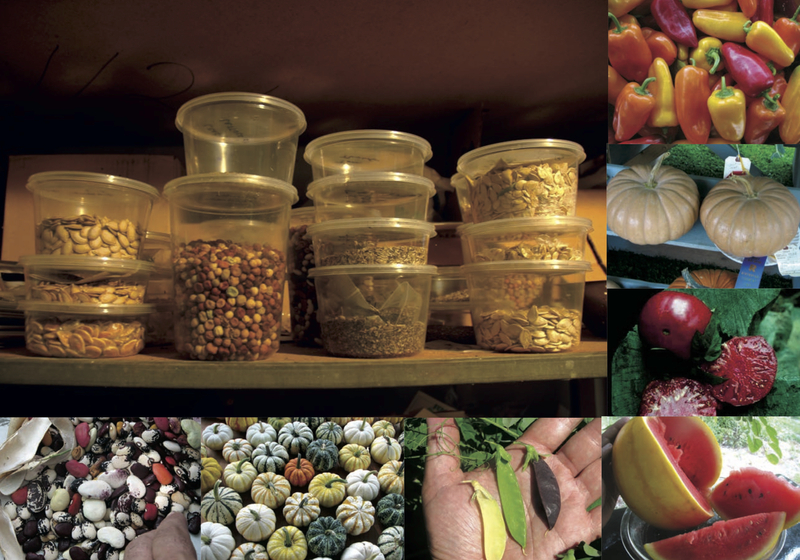 The room doesn’t present an obvious organizational system (a common problem with seed banks around the world, according to a recent New Yorker article on an effort to create a global seed bank). Pole beans were next to fennel, tomatoes were next to sweet corn, kale and cabbage were next to okra. The disarray spilled onto the kitchen counters and dining room table where seed pods and flower heads were in varying stages of processing. Ettlinger claims that he organizes the room each winter after harvest, only to turn it upside down each spring when he selects what he will plant. The room contains thousands of seed varieties, including many that Ettlinger hasn’t even planted yet. His tomato seed collection alone includes 500 to 600 distinct types. One large salad bowl looks like it holds dozens of bean varieties—a rainbow of colors, a jigsaw puzzle of shapes, and a size range that includes seeds triple the size of others; they all came from the recently harvested patch of lima bean plants. Some of his holdings and creations, including deli containers of sunflower, pea, and carrot seeds; fingerling peppers; Long Island Cheese pumpkins; Brandywine tomatoes; yellow-skinned watermelon; golden and purple peas; miniature edible pumpkins; and lima beans. But it mostly just requires persistence and patience and good recall. Despite an encyclopedic memory, he uses maps and markers and other cues to denote plants worth watching. To assess taste qualities, Ettlinger often has tasting parties or brings a bunch of tomatoes or peppers to a particularly discerning gastronome. When he’s cutting up peppers to save seed, he’ll often pop a strip of the flesh in his mouth and take note of the tanginess or flavor. Ettlinger’s most recent effort to spread this message was the Organic Seed Project, a bicoastal collaboration between Oregon State University in Corvalis and the New York chapter of NOFA, the Northeast Organic Farmers Association. 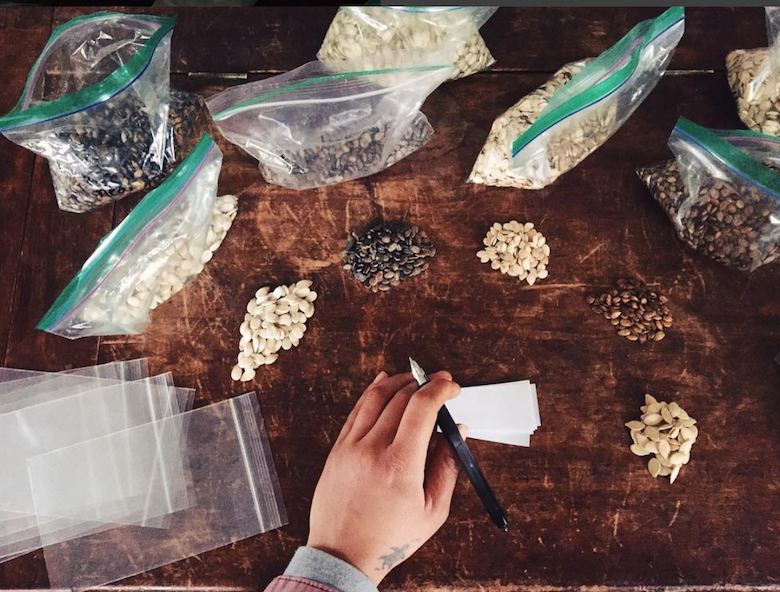 Because seed companies breed vegetables primarily for large-scale conventional farms, the Organic Seed Project trained small-scale, organic farmers from New York and Oregon in the basics of seed saving. Farmers—who, for thousands of years, were the sole seed breeders—were then given seed varieties to grow and save on their own farms, looking for traits that might work in their particular circumstances. “What’s really neat and inspired about the project is breeders from around the country were sending out partially bred seeds and inviting farmers to finish them,” said Ettlinger. He remains optimistic that most people will choose diversity over monotony, and he points to the growing popularity of farmers markets, heirloom and heritage breeds, and membership in groups like Slow Food, devoted to celebrating the unique foods of millions of communities around the world. 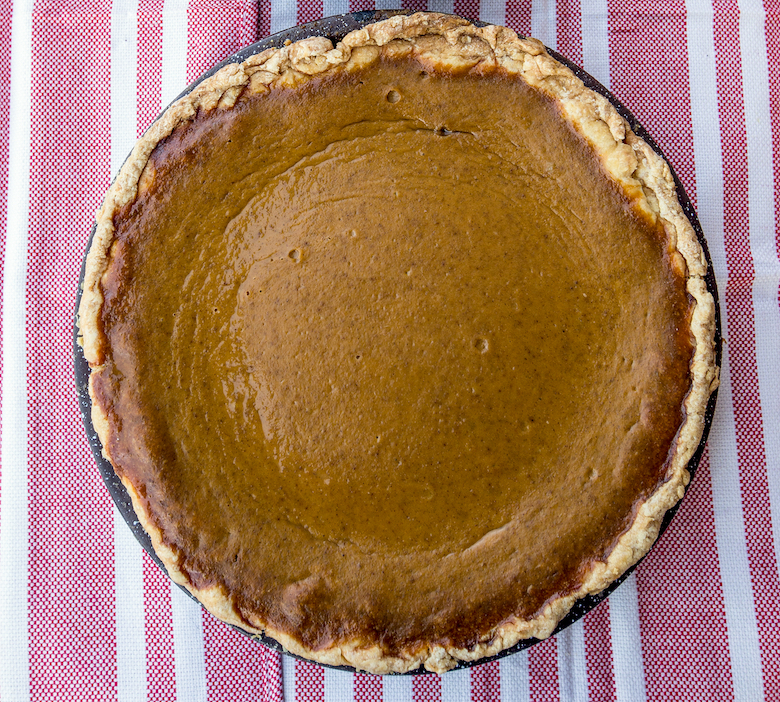 We used to bake pumpkin pies for our farm-stand patrons (as a by-product of our seed production), until the demand was so great we could do nothing but bake pies. People would show up at 7 a.m. for pie. It probably would have been lucrative but there just aren’t enough hours in the day! For pumpkin pie, moschata squash like Long Island cheese is favored. We never use pepo squash like the standard Halloween pumpkin. Pepo squash often cooks up stringy, insipid and watery. Moschata squash is richly colored (usually bright orange), higher in nutrients and sugars, always smooth-grained and has a denser flesh that will result in a better custard. It’s the same reason we use chunks of moschata squash in our winter roasts and stews. Cheese pumpkins can also be stored in a cool room of your house for most of the winter for future use. 2. Add pumpkin pie spices. For every 2 cups of pureed squash add 1 1/2 teaspoons of cinnamon, 1/2 teaspoon of ginger, 1/4 teaspoon cloves and 1/2 teaspoon of salt. 3. Since you’re essentially making a custard, add your custard ingredients: 2 eggs, 1 can of evaporated milk (or 1 cup of whole milk or light cream) and 3/4 cup sugar for every 2 cups of pureed squash. Everything should be nice and blended to pour into a deep unbaked pie crust.